IZEA, the social media marketing company and the world leader in sponsored conversations is organizing IZEAFest 2009, an interactive event designed to educate, inform and connect social media enthusiasts. It's one of the most sought after event for the bloggers around the world. It means a lot of fun, tonnes of new networks, friends and unlimited opportunities for your blog. Oh! yes, but don't have a ticket..
IZEA Insider Drew Bennett (aka BenSpark) is crew leader of the "I'm Not A Famous Blogger" Crew and he has created the "I'm Not A Famous Blogger" Blog to spotlight all the latest IZEA info as well as crew members. Crew members are invited to participate in crew interviews. Spotlighting bloggers on the crew is the main objective of this blog and who better to spotlight a blogger than the bloggers themselves. Each interview gives a unique perspective on the challenges and accomplishments of the members of the "I'm Not A Famous Blogger" IZEA Insider Crew. BenSpark is also trying to help his crew by creating unique opportunities on SocialSpark including the latest, a SocialSpark CPC opp for his Ultimate IZEAFest Prize Pack Contest. This opportunity is only open to members of the "I'm Not A Famous Blogger" IZEA Insider Crew. 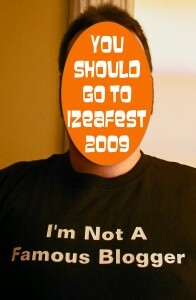 If you would like to go to IZEAFest this year but you don't have a ticket, why not win one. "I'm Not A Famous Blogger" IZEA Insider Crew Leader BenSpark has three passes to give away. Not satisfied with only giving away passes he's recruited sponsors to give away even more. Three people will win IZEAFest passes but one very lucky blogger is going to win The Ultimate IZEAFest Prize Pack. BenSpark teamed up with many of his favorite sponsors and bloggers to gather many of the 10 essential items for IZEAFest to put into a very special prize pack. The prizes range from an xshot camera extender to an Asus Eee PC 1000HA. However, Runner up winners will also get prize packs of their own. The biggest prize of course is the IZEAFest ticket itself. With this pass the blogger is going to get more than they can imagine. This includes a welcome party at Busch Gardens to a blogger takeover day at SeaWorld, all included in the ticket. But also you will be part of a very intimate gathering of bloggers, the number of attendees is limited to 300 so this is pretty exclusive. You will more likely be able to chat with speakers like Brian Clark (copyblogger), Chris Brogan and even IZEA CEO Ted Murphy in a setting like this than any other blogger conference all year. Go and grab the opportunity..
can guarantee you that it's worth a try..!! Hem.. IZEA is famous on line marketing company in my opinion. hey!! where's my link? i put your link on mine..
please put my link... i'll check again..
@Dana I agree, IZEA is a marketing company, but it uses the social media s its prime tool. Be it sponsored posts, or tweeter links. @ Animosity, Right now I am not able to show any blog in my blog list. It's because of some technical stuff. Once, I am able to rectify it, I would show them. hey jammy, thanks for your post and helping me spread the word.